In the 1940s and 50s, there were few water nymphs as spectacularly watchable as US swimming champion, Esther Williams. A natural athlete, in her teens Williams had already busted through a number of national swimming records but unfortunately, the inconvenient outbreak of WW2 put a hold on her plans to take on the 1940 Olympics. Instead, Williams joined Billy Rose's Aquacade, a swimming, dance and musical show and it was there that she was discovered by MGM talent scouts, on the look-out for a rival to Fox's sporting star, Sonia Henie (an Olympic ice-skater turned film star). Esther in a bright two-piece. After appearing in bit parts in a wholesome Andy Hardy film and 1943's a Date with Joe, which starred the equally squeaky clean, boy-next-door, Van Johnson, MGM took another tack with it's aquatic starlet. Nicknamed the Million Dollar Mermaid, (after her highest grossing film) Williams's was to emerge a unique MGM mega-star after the studio decided to utilise the swimmer's athletic talents in a series of new genre films, known as aquamusicals, The films were constructed around impressively choreographed, balletic synchronised swimming and diving scenes and while they exemplified a certain type of over-the-top Hollywood kitsch, they're still mesmerising to watch. It was also dangerous work; not only did she have to hold her breath for several minutes but more than once she found herself nursing injuries from the stunt antics that were required of her on the set. Esther was the glamour queen of the swim world and did much to raise the profile of synchronised swimming - she was not only a highly accomplished athlete with a dazzling white smile but she knew how to pose in a swimsuit. In the water she was as elegant as water reed bending in the breeze and as luminous as a glow fish and on land she possessed the kind of health, confidence and sexual vitality that got swimsuit manufacturers salivating. Esther was the first woman to make an independent living from endorsements - you guessed it, bathing suits. The star's swimsuits were typical of the era and reflected the voluptuous 40s/ early 50s look, with the emphasis on stiffish, built-in bras, low backs and waist-hugging hour glass shapes. Interestingly, the crotch area of the 40s swimsuit was far more modest than todays suits and invariably featured a discreet little 'skirt' of material. It was the pre-Brazilian era after all. If Esther's Hollywood career was relatively smooth sailing, her private life sometimes bounced around on rough seas, having waded through four marriages, an affair with Victor Mature and Jeff Chandler, whom she claimed, controversially, was a cross-dresser in her in her 2000 autobiography. 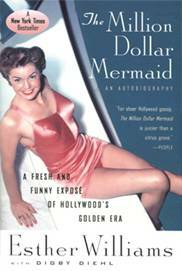 Esther Williams retired from her aquamusicals in 1960 but proved to be no fish out of water. Revealing a sharp business acumen, she launched into a swimming pool business as well as a line of retro swimwear - in the latter case citing a need to contain women with less than perfect figures in form-fitting but supportive swimwear: "I don't want you to be in two Dixie cups and a fish line". At least those old swimsuits from the 50s held you in.